The Scottish Government has funded a 3 year project which we are calling Keeping Safe. Produce a new resource based on the feedback from earlier projects This has 3 topics of conversation . Firstly ,How people are feeling about their Health and well-being secondly, their relationships. For people who are able to think and express their views at a more abstract level the resource has a third topic and gives them space to reflect on their thoughts and feelings. If you work with adults with learning disabilities in Scotland and would be like to be part of this exciting initiative please contact us at info@talkingmats.com. This entry was posted in Adult protection, Blog, Learning disability, Participation, Personalisation and tagged Abuse, capacity, Disclosure, Learning Disability, Participation, Personalisation, Talking Mats, Training on November 28, 2014 by Lois Cameron. Thanks to an OT colleague for this powerful story of how Talking Mats helped a woman with Multiple Sclerosis with goal setting by getting to the root of the problems she was having. I am an OT working in a community rehabilitation team in Scotland. I have been seeing a woman (who I will call Jill) with MS. Jill has been experiencing increasing problems associated with her MS and finding it difficult to cope. During my first visit, Jill found it difficult to tell me about the problems she had been experiencing, and almost impossible to consider how we could translate these problems into tangible goals that we could work on. She was closed to any suggestions I made about potential rehabilitation goals. In her mind, the problems she had were there to stay, nothing could be done about them and she would just have to struggle on. We didn’t seem to be getting anywhere just talking about it. Jill was getting a bit exasperated and I was finding it difficult to keep a structure to our conversation and steer it towards agreeing on a goal that we could work towards. I felt there was a real risk of her disengaging from the service because we could not agree on a way forward. Then I decided to use Talking Mats to see if that would help. I knew that using Talking Mats could help people with cognitive problems as well as those with communication difficulties. I wondered if doing a general Talking Mat using the Health and Well-being TOPIC symbols would help me identify what Jill thought her main problem areas were. Then I planned to do a sub-mat to look at her priority areas in more detail. My aim was to try and identify one or two rehabilitation goals (reflecting Jill’s priorities) that we could work towards. I really felt that there was potential to make a positive impact on Jill’s quality of life if I could get her to engage and agree on a goal to work towards. Using Talking Mats proved to be a great success. Jill very quickly got the concept of it. It seemed to be much easier for her to pick up a symbol card, consider it, and then place it on the Mat. Using the Mat appeared to reduce the ‘cognitive load’ of the conversation and gave her structure to work within which she found much easier. Jill was able to identify what her main problem areas/ priorities were: – Mobility and Learning/ Thinking (see picture of her Mat above). Jill was pleased that she had got her message across and actually seemed to enjoy the process of using Talking Mats. Now we have got a starting point. In my next session I’m hoping to complete sub-Mats with Jill in the Topics of Mobility and Learning/Thinking. This will allow us to explore these areas in more detail. Using Talking Mats was a real breakthrough in Jill’s rehabilitation. This entry was posted in Blog, Multiple Sclerosis, Occupational therapy, Participation, Self directed care and tagged goal setting, occupational therapy, Participation, Talking Mats on November 14, 2014 by Guest Blogger. 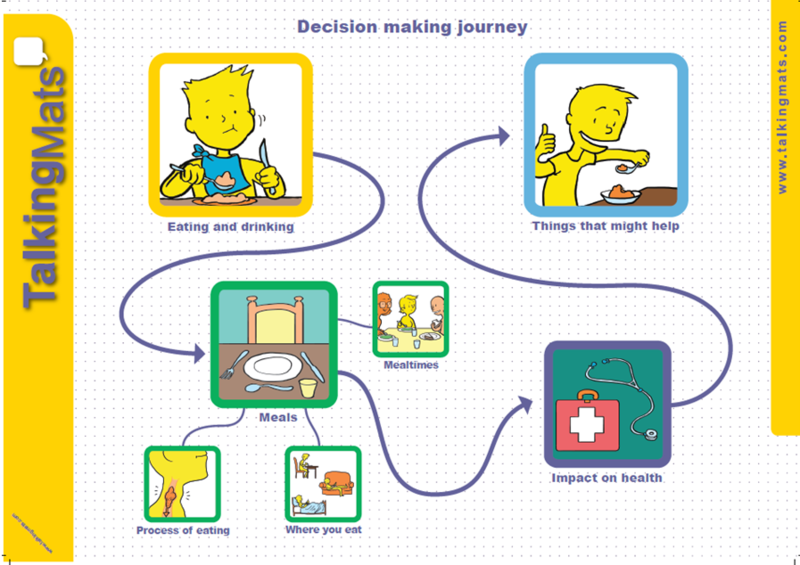 We are launching our fantastic eating and drinking resource to support shared decision making. This has been co-produced with the help of people with eating and drinking difficulties and a range of different professionals. The resource is designed to help people think about, discuss and make informed decisions about how to manage their eating and drinking more safely. People with eating and drinking difficulties should initially be assessed by a qualified Speech and Language Therapist and Dietitian who will recommend appropriate strategies to help them eat and drink safely. This resource is particularly useful in helping people understand the effect that their eating and drinking difficulties can have on their health. It also helps people talk about how they feel about recommended strategies. When discussing eating and drinking, there are many issues to consider. We have provided symbols under three main topics to help present ideas in a structured way that reduces the likelihood that the person will be influenced. Click on this image to see it more clearly. Discussing these topics separately means that people can firstly consider how they feel about different meal times, where they eat and types of food and then think about the impact that their eating and drinking has on their health. It also allows people to have a conversation about some of the suggested strategies and how acceptable these are. Contact info@talkingmats.com for further information if you wish to attend a seminar in the future. This entry was posted in Blog, Communication difficulties, Eating and drinking, Learning disability, Multiple Sclerosis, Participation, Self directed care and tagged AAC, Communication difficulties, Dietetics, Learning Disability, Participation, Self directed care, Talking Mats on November 6, 2014 by Joan Murphy. 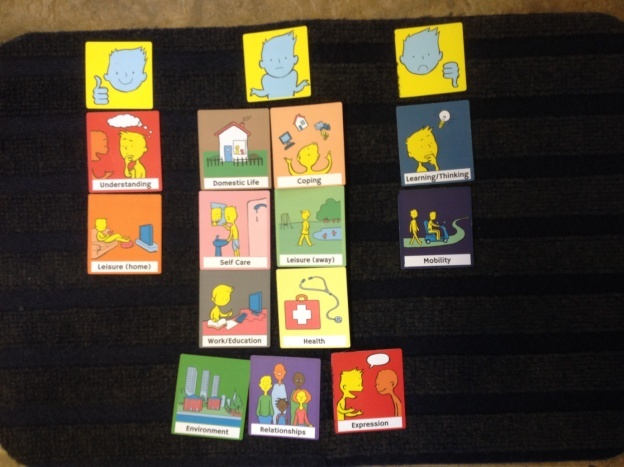 Thanks to Lauren Pettit for this thought provoking blog about using Talking Mats in a rehabilitation setting in South Africa to compare goals of adults with aphasia, their Speech and Language Therapists and their significant others. I am a Speech-Language Therapist in Johannesburg, South Africa and I work in neuro rehabilitation for people who have had a stroke or head injury. Over the past few years, I have been inspired to learn more about implementing communication modes to assist people to participate effectively in various communication interactions. Talking Mats™ is such a wonderful tool that enables people to communicate so many things, from their needs and desires, to engaging in higher level conversations. I have seen the benefits of this tool used in a rehabilitative setting. I recently completed my dissertation with the Centre for Augmentative and Alternative Communication (CAAC) at the University of Pretoria, in South Africa. The study included adults with aphasia who were still attending therapy at least 6 months after their stroke and were working on activities and tasks in various therapies, for example: Occupational Therapy, Physiotherapy, Speech-Language Therapy, therapies. I wanted to understand what was important for them to work on in rehabilitation to improve in various areas of life. Some of the adults with aphasia had very little or no speech, others had difficulty expressing themselves and finding the appropriate words to use in a phrase or sentence. Talking Mats™ was therefore used to assist them to rate important life areas. The life areas (activities and participation domains) were identified by the International Classification of Functioning, Health and Disability (ICF). This classification system was created by the World Health Organisation (WHO) and may guide therapy assessment and management. The areas were depicted as symbols with a supplemented written word on each card. These nine cards were: Domestic Life, Relationships, Work and Education, Leisure or Spare time, Self Care, Learning and Thinking, Coping, Communication, and Mobility. The adults with aphasia were asked what was important to them to work on in rehabilitation. The adult with aphasia could place the card under Yes, Maybe or No on the velcro mat and provide a comment if he/she wished or was able to. The Speech-Language Therapists who worked with the adults with aphasia and their significant others (a family member/friend or carer, who knew the person well) were also included in the study. They were asked to identify which areas they thought were important for the adult with aphasia to still work on in therapy. It was very interesting to see varied opinions in the results. Six of the areas received similar ratings from all the participants and Communication was highlighted as an important area to work on by all. There were statistical differences found for the following domains: Work and Education, Leisure or spare time and Self Care. 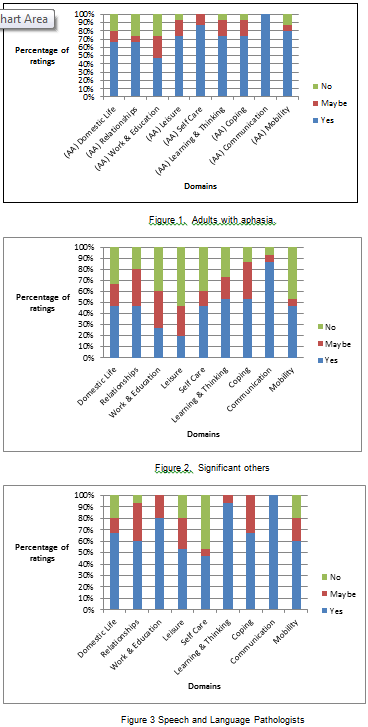 The adults with aphasia wanted to work on Leisure or Spare time and Self Care, however, Work and Education was not important to them to work on in rehabilitation, whereas the Speech-Language Therapists rated Work and Education as important for the adults with aphasia to work on. Significant others did not rate these domains as important. This study gave a glimpse into how some rehabilitation teams are currently communicating and working together and that very often, the people who have difficulties expressing themselves are perhaps not always given the time and space to understand the therapy plan and identify and communicate their individual therapy needs. This needs to be explored further. 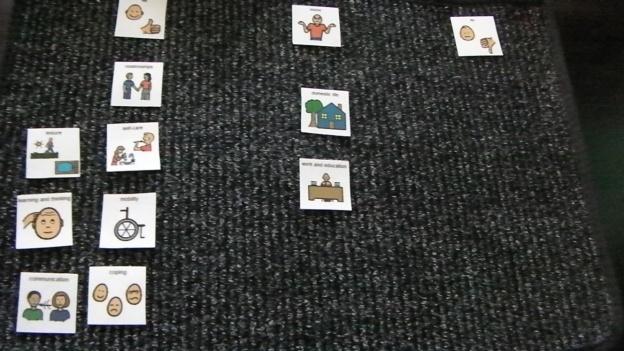 Talking Mats™ provided a structure and gave the adults with aphasia a ‘voice’ and the opportunity to engage in this complex communicative interaction. 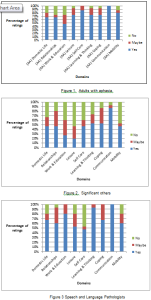 I am in the process of sharing the results from the study with the participants. I have encouraged them to sit together in their teams and identify areas that could currently be focussed on in their therapy. Many participants were eager to discuss the results after the interviews were conducted and were interested in the concept of prioritising their rehabilitation needs. I hope they see their participation in this study as the opportunity to further engage in their rehabilitation needs and that it gives them the confidence to participate more fully in many other areas of their lives that they identified as important. 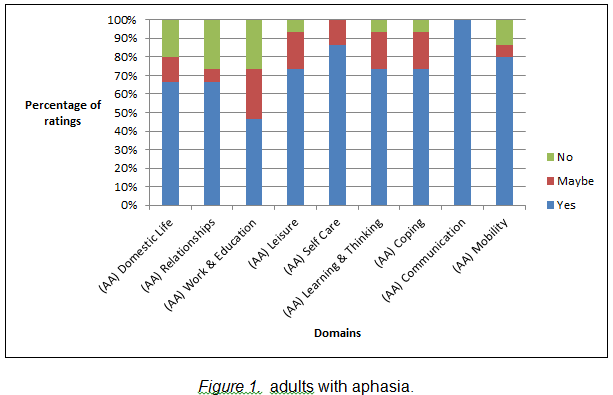 This entry was posted in Aphasia, Blog, Communication difficulties, Participation, Personalisation, Research, Self directed care, Talking Mats principles and tagged AAC, Communication difficulties, goal setting, Participation, Personalisation, Research, Talking Mats on November 1, 2014 by Joan Murphy.